In: Proceedings of the 2019 Intelligent Systems Conference. Intelligent Systems Conference (IntelliSys-2019) September 5-6 London United Kingdom Advances in Intelligent Systems and Computing Springer 9/2019. In: Proceedings of the 18th European Conference on Cyber Warfare and Security. European Conference on Cyber Warfare and Security (ECCWS-2019) July 4-5 Coimbar Portugal ACPI 7/2019. In: Keith Brawner, Roman Barták (Hrsg.). 32nd International FLAIRS Conference. International FLAIRS Conference (FLAIRS-2019) May 19-22 Sarasota Florida United States AAAI Press 5/2019. In: ITG-Fachbericht. 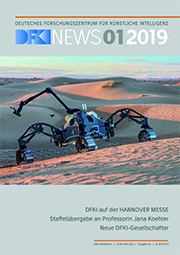 VDE/ITG Fachtagung Mobilkommunikation (MKT-2019) May 15-16 Osnabrück Germany VDE 5/2019. In: IEEE Transactions on Very Large Scale Integration (VLSI) Systems 27 4 Seiten 875-887 IEEE 4/2019.